When I was growing up long ago when dinosaurs walked the earth and Osborne Computers were state of the art products Halloween was something that as far as I could tell was primarily for young children. Because of religious/cultural reasons my family didn't celebrate Halloween so I never dressed up in costume or got to eat candy (another thing which was forbidden). But aside from teachers that would dress up along with their young, pre-high school, students I don't seem to recall a lot of adults or even older teens getting involved in the celebratory atmosphere. They could have been of course since being a kid I wasn't quite privy to much of what was really going on. And perhaps I was just living in the wrong neighborhood. But that's just not what I recall. These days things are different. Halloween seems to have become much bigger and much more politically and adult oriented. Rather than a child dressing up as Spiderman or a Count Dracula, now children are dressing up as Klansmen. And rather than teens or adults dressing up as television characters or naughty maids, some people just seem to want to go for shock value and dress up in blackface. Blackface has a long history in American and European culture. It's never good. It can't really be separated from ridicule and hatred of blackness itself. For an apparently sizable number of white people, blackness remains something to be mocked. Evidently Halloween has become a time for some folks when they can literally let their hair down and share with the world the racism they've been holding on to all year. When people get called on this as they usually are once the pictures and/or videos leak out there are occasional half-hearted apologies but just as often one is likely to see or hear unrepentant admonishments of other's so-called "political correctness" or ridiculous appeals to "free speech". This last was promulgated by a supposed left-leaning civil liberties loving attorney who really ought to know better. It makes one wonder about the cultural sensitivities extant in this country when Ebay can be shamed into ceasing the sale of Holocaust memorabilia with apparently no pushback from those sordid folks who really really wanted that concentration camp uniform with the ever so slight scent of Zyklon-B but apparently it's an affront to freedom to suggest that people refrain from mocking an entire race of people. As we've discussed previously all free speech means is that within certain restrictions the government is not able to write a law telling you what you can or can't say, act like or dress like within the boundaries of your own home (or other people's homes). The government shouldn't and can't send you to prison or to re-education camps for having the wrong racial views, as one thoroughly asinine commenter on Turley's site claimed. I don't advocate any such thing. If you want to be a racist or traffic in racist tropes, I say knock yourself out. It's actually sometimes easier for me to deal with a white person once I am clear beyond all doubt that he or she has nothing but contempt for black people. It's a free country and like everyone else people wearing blackface can say what they like. Free speech however doesn't mean that you are free from other people's criticism of your speech or actions. And it certainly doesn't mean that your employer can't decide that your speech, even if it took place outside of work hours, is something with which it doesn't want to be associated. But the deeper question, which people defending blackface depictions can't answer, at least to my satisfaction, is what is so humorous about being black to some white people in the first place? Why is it that some whites or other non-blacks year after year wish to have ghetto parties, or dress like a n***** parties? What apparently deep itch are they scratching? Evidently there is something which is self-evidently tremendously humorous about being black. But I'm not getting the joke. Anyone care to explain. 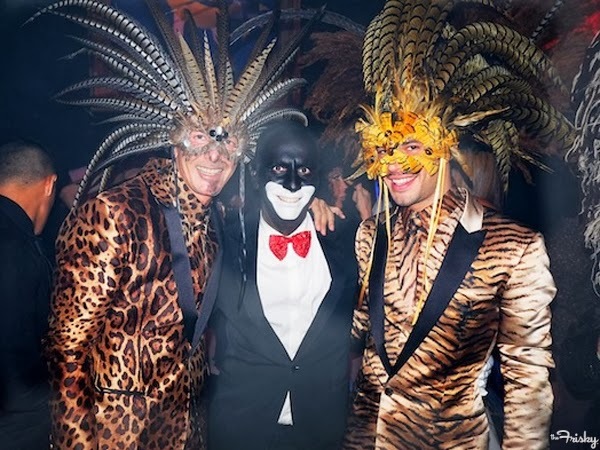 Generally speaking, and I've been around a while, I can't recall too many instances where black people have thrown a "Dress up like a white person" party and shown up in whiteface or stereotyped "white" clothing whatever that might be. No this racial mocking seems to mostly go one way. And the fact that it pops up consistently year after year lets even the most clueless observer know that racism is far from a thing of the past. It's part of the country's DNA and isn't going anywhere anytime soon. I think that some of this might be reaction to the election and re-election of President Barack Obama. But most of this is just good old fashioned bigotry handed down from mother to daughter and father to son. The issue is that many of the people depicted will be in the future or are currently in positions of power whether we're talking hiring and firing, law enforcement or of course juries. If this is how they see Black people, and they are telling us that it absolutely is, how could any black person expect fair treatment. If you can mock Trayvon's Martin's death and you're on a jury with a black victim or a black defendant, can you really do justice. I doubt it. The reaction to a woman's Boston Marathon Halloween costume and the mainstream collective shrug to blackface/slave costumes tells me all I need to know.